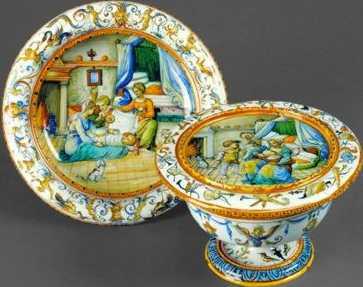 In Renaissance Italy, parturition or birthing sets were used to serve nourishing foods to women who were confined to bed during pregnancy or after childbirth. These sets, usually consisting of five or more pieces (such as bowls, a tray, saltcellar and a cover), would all fit together when not in use. The painted decoration depicts a scene in the bedchamber immediately following birth: bathing, swaddling, and nursing the newborn infant. Lively grotesques fill the remaining surfaces. 1. The objects in question are a plate, a vase-like bowl and a covering for the bowl. All three objects are rounded in shape, are glossy, and contain much decoration. They appear to be handcrafted, and are made out of a ceramic-type material. 2. The objects measure at about 10 inches for the bowl, to about 15 inches for the plate, and about 12 inches for the cover. Each object is circular in form: the plates are both flat circles, whereas the bowl is deeper and can hold substance, and is supported by a circular stand attached at the bottom, which is a little less in diameter of circumference than the bowl. 3. All three objects are decorated with scrolls, swirling blue motifs interspersed with yellow and blue depictions of various objects, on a white background. The decorative grotesques are framed by yellow circular outlines, which separate the decoration from the central art piece in the centre of the plate and cover. The plate depicts a birthing scene in the Renaissance style,where at the centre of the composition, a mother is seen swaddling her infant (in blue) along with her nurse (in orange). Another older child is seen peering from behind the white cloth in the centre of the piece. In the foreground, a small, white cat with a ribbon is resting. The figures are set in the bedchamber, which is evident of Renaissance design,as are the clothing of the figures. The scene is very colourful,including various shades of blues, reds, browns, greens and yellows. The scene on the cover is also set in the same chamber (the same bed, wall and floor design,and sheets), except in this scene the mother is seen coddling her baby, as her older child looks on. The same colour palette is employed, as is the same proportion and perspective of design based upon the central triangular point of focus in the foreground of the picture, with the room as the background. 4.The pieces appear in good shape, with minor chips on the base of the bowl. Two pieces making up the original five piece set, however, are missing. 5.The decorative elements on these pieces indicate that they were produced in the workshop of Orazio Fontana in Urbino, Italy. The pictures on the plate and cover are produced in the Renaissance design style. These pieces are part of the large body of parturition maiolica, which was utilized during the Renaissance to ease the anxieties of a pregnant mother through depictions of calm, joyful birthing chamber scenes, utilizing the beautiful decorative elements popular in this period. 6. The objects were used to carry nourishing foods to women during pregnancy and childbirth. The artistic depictions of the objects are indicative of the Renaissance belief that visual elements had the ability to conjure certain responses within the viewer. In this case, the joyful birthing chamber scenes, with a healthy baby being either coddled or swaddling, would inspire the pregnant woman to similarly have a healthy child during a time when giving birth and the health of babies was very risky and death rates where relatively high. The Renaissance was also a period of plague, which would give extra meaning to the need for a pregnant mother to be inspired by optimistic birthing scenes. 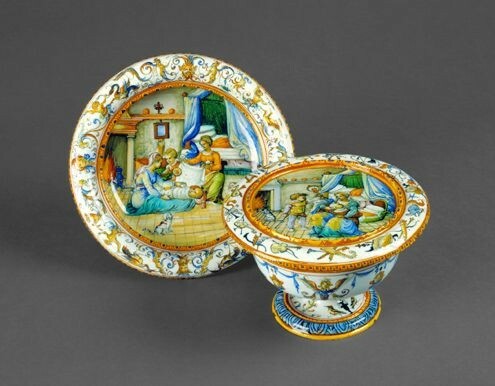 Since maiolica production was a costly enterprise, and the art decoration of the objects is intricately detailed, it is evident that the owner of the objects was wealthy and could afford to purchase these objects (a husband for his wife) which were popular among the elite, especially wealthy merchants. 7. A wife who would receive these objects during her pregnancy would feel deeply appreciated by her husband, who would in turn hope to evoke his wife into having healthy babies (boys especially) to maintain the family lineage. Moreover, the objects would be a conspicuous sign of wealth, and during a time when birthing chambers were public domains, where the entire family, both male and female, would visit the mother upon giving birth, such objects would be a great sign of prestige. Having such objects further emphasized the need for pregnant women to be nourished due to the great health hazards of both pregnancy and childbirth. These objects also confirmed the subjegation of the wife to her husband, where even those objects directly related to her condition in life were not specifically hers to keep, for they would often be passed on as heirlooms to the child that was born (in most cases, only if it was a male). These implications of the parturition set speak volumes about the role of women in Renaissance society, as childbearers for their husbands, and as individuals unable to purchase goods or, in many cases, even inherit them. 8. These objects have the dual role of indicating the cultural and artistic sensibilities of the period, and in depicting the reality of gender relations of the time. In light of today's values, these objects would be considered as being highly time-consuming and costly to make because they are handcrafted. More importantly, such objects do not exist in today's world in exactly the same form, nor does the emphasis on pregnancy and childbearing through the exchange of goods which are specifically created for that period of a woman's life. Modern day health standards have taken away most of the risk relating to pregnancy and childbirth, and infant survival rates are extremely high in the modern world. In these context, these objects lose their implications, particularly when considering the changed nature of gender roles in modern society, where women have become predominant consumers and exercise rights and freedoms far exceeding those of their predecessors.